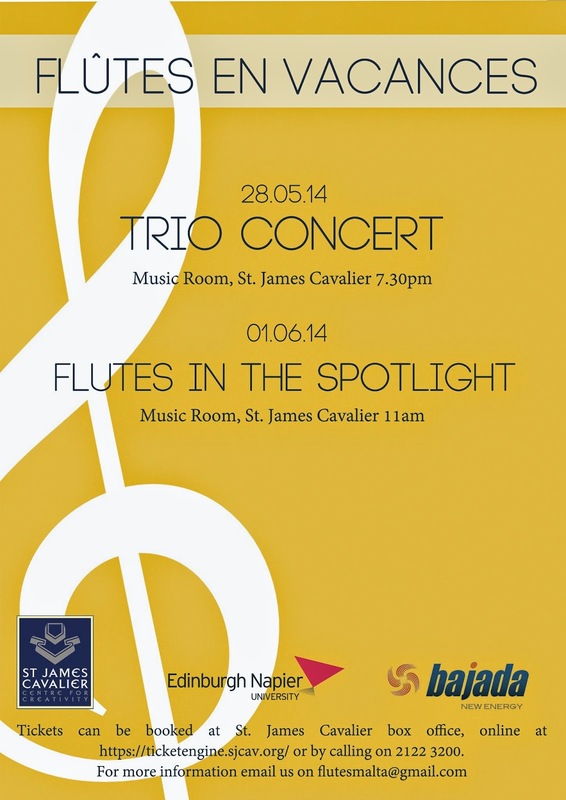 This is the first concert of the Flûtes en Vacance series which will take place between 28th May and 1st June. The series features Maltese and Scottish flautists studying at Edinburgh Napier University performing in various flute ensembles. The series is funded by the Napier Student Initiative Grant and the Malta Arts Fund. The first concert in the series features Maltese flautists Laura Cioffi and Clara Galea, known as Duo Aulos, performing a selection of works written for 2 flutes and piano with the talented pianist Gisèle Grima, an Napier University alumnus herself. All the three performers are Ian Tomlin Scholars. Duo Aulos - Laura Cioffi and Clara Galea have been playing together since 2004. Their debut performance was at the Presidential Palace in Attard, Malta. Since then, they have appeared together in various concerts and in most prestigious venues around Malta. They have performed together both as a duo and as part of larger ensembles. Recently they have stated to launch themselves as Duo Aulos and have put up 3 recitals of flute duo music, in the Carmelite Priory in Mdina, in St. Catherine’s Church Valletta and in St. Giles’ High Kirk, Edinburgh. Together they have taken part in youth orchestral projects like BISYOC, where they were involved not only as performers but also in the administrative side. They were both principals flautists with the Malta Youth Orchestra and are currently part-timers with the Malta Philharmonic Orchestra. Since they moved to Scotland, they have immersed themselves in the Scottish music scene and they have joined the St. Andrew’s and St. George’s West Choir and the Flutes Unlimited Flute Choir in Glasgow. They are currently reading for a BMus (Hons) degrees at Edinburgh Napier University with Andrea Kuypers. Their studies in Edinburgh are made possible thanks to the Ian Tomlin Malta Music Scholarship. Since they have known each other for so long, Clara and Laura feel that they have been instrumental in each other’s musical development. Gisèle Grima merits her status as “one of the leading Maltese pianists of her generation” (The Sunday Times, Malta). She has rapidly established herself as a prominent performer and sought-after accompanist both locally and overseas. Her solo and chamber recitals have taken her around Malta, Sicily, Finland, Iceland, South-West France, Syria, Manchester, Edinburgh and London. Gisèle has appeared in various festivals including the International Spring Orchestra Festival 2010 & 2013, Malta Arts Festival 2007 and the Victoria Arts Festival 2012. In May 2010 she made her début as a concerto artist with the Malta Philharmonic Orchestra performing Ravel’s Piano Concerto in G major under the baton of Michael Laus. Gisèle began her music studies in Malta with Josianne Vella Bardon, Lydia Buttigieg and Maria Dolores Amodio Chircop. Between 2003 and 2009, she furthered her music studies with Nicholas Ashton, Lauri Väinmaa, Tiina Kärblane and Paul Roberts. She is a graduate of Napier University, Edinburgh where she obtained a First Class Honours degree and the recipient of scholarships from the MGSS, the Janatha Stubbs Fund and Dr. Ian Tomlin. In 2008, Gisèle graduated with a Master of Music in performance with Distinction and a Postgraduate Diploma in performance in 2009 from the RNCM. She was subsequently awarded the William Humphreys Dayas Prize as a result of her success to place as a finalist in the highly competitive Piano Recital Prize. Gisèle has also received training from Franco Foderà, Brian Schembri, Cynthia Turner, Carole Presland, Dina Parakhina, Graham Scott, Dmitri Rachmanov, Iris Senturker, Phillipe Cassard, Harold Gray, John Lill, Drake, David Jones, Pavel Fischer and Ian Brown. Gisèle is proud to have been appointed a trustee member for the Ian Tomlin Napier/Malta Scholarship Fund. She also holds both LLCM and FRSM performance diplomas.